Get ready for a new Transformers from Shout Factory!! I know my boys are pumped as if I wasn't sure they'd want this one already. When I asked Dane he jumped up and screamed, "Um yeah!!" On May 13, 2014, Shout! Factory, in collaboration with Hasbro Studios, will release TRANSFORMERS ENERGON VOLUME ONE DVD on family home entertainment shelves at Walmart stores. 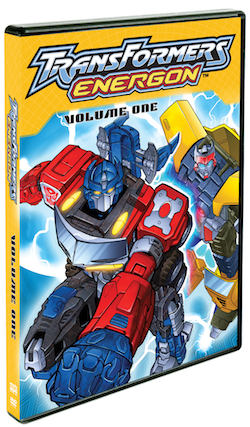 Featuring the first seven adventure-filled episodes from TRANSFORMERS ENERGON, this new DVD delivers fun-filled home entertainment that kids and parents will enjoy! Bring home TRANSFORMERS ENERGON VOLUME ONE DVD at an affordable low price of $5.97 SRP.